Shirana Shahbazi’s solo show at the Swiss Institute in New York featured thirteen lush, vivid photographs and one large painting. Her largest exhibition to date in the US took in portraiture and landscape, along with translations of still life painting into photography and back. The walls of SI were painted black for the exhibit, and the lights were low, creating a climate of hushed art-historical reverence. Indeed, many of Shahbazi’s photographs employed motifs lifted from European art history. This lent the show a slightly stodgy, referential quality — the atmosphere was a cross between a diamond merchant’s showroom and the heavy arcanum of a Peter Greenaway film. 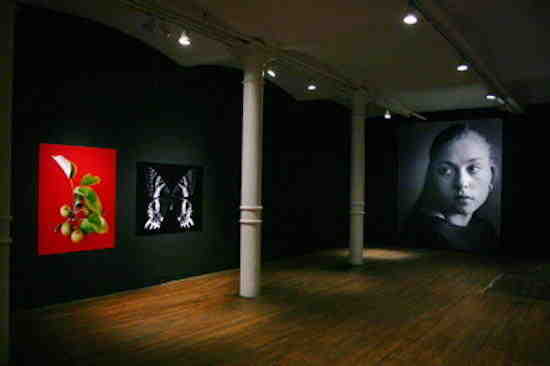 Many images in the exhibition were hung like pendants, acting on each other as psychic counterpoints. The pairs Ania-07-2005/Sango-04-2003 and Texas-01-2004/Stas-01-2005 both combined a landscape with a portrait. Sango-04-2003 featured a country road passing through wilderness; alongside it hung Ania-07-2005, in which a young woman turned her gaze out a window onto an overcast day. The portrait mingled Vermeer-like prettiness with the grittier realism of documentary photography; the effect was melancholy. Also in Texas-01-2004 and Stas-01-2005, the subjects’ heads tilted or turned away from the landscape. Through this gesture (an example of the art-historical nuance in the show), the figures were inextricably bound to the depth of the scene in their partner work. Other subjects in the show were shot with iconic straightforwardness, like specimens or illustrations. Mineral-07-2007, Orchidee-02-2007, Schmetterling-15-2007, Schmetterling-09-2007, Frucht-01-2007 — an asteroid-like rock, a flower, a butterfly, another butterfly, and some fruits, respectively — sat front and center in the frame over a background that was either a black void (Mineral-07-2007, Schmetterling-15-2007, Schmetterling-09-2007) or a single DayGlo color (Frucht-01-2007, Orchidee-02-2007). Shahbazi presented the objects in their most basic essence, as if to simply document their very existence or to explain them to a child for the first time. This very literal presentation made art of the objects’ very existence, as if for the benefit of an alien being unfamiliar with the earth’s riches, or for a human who has forgotten them. ‘Meanwhile’ reminded viewers how difficult it can be to claim everyday forms as content, for this kind of space typically serves as an opening through which to access looser, more expressive (and thus more accurate) forms in reflexive opposition to the tyranny of onerous, monumental, historical ones. Because the nature of Shahbazi’s interest in the everyday was never fully disclosed, and because the everyday, in its essence, has no inherent character of its own, the show occasionally ran the risk of evaporating into the air of its own air.